FILE - The Broadcom logo is pictured on an office building in Rancho Bernardo, California, May 12, 2016. 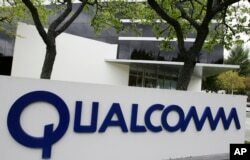 Behind the U.S. move to block Singapore-based Broadcom's hostile bid for U.S. chipmaker Qualcomm lies a new global struggle for influence over next-generation communications technology — and fears that whoever takes the lead could exploit that advantage for economic gain, theft and espionage. 5G remains in the early stages of development. Companies including Qualcomm, based in San Diego, and China's Huawei have been investing heavily to stake their claim in the underlying technology. Such beachheads can be enormously valuable; control over basic technologies and their patents can yield huge fortunes in computer chips, software and related equipment. FILE - Broadcom CEO Hock Tan speaks while U.S. President Donald Trump listens during an event at the White House in Washington, Nov. 2, 2017. 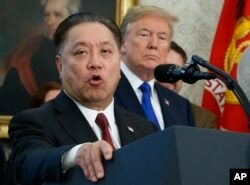 President Donald Trump said late Monday that a takeover of Qualcomm would imperil national security, effectively ending Broadcom's $117 billion buyout bid. Broadcom said that it is studying the order and that it doesn't believe it poses any national security threat to the U.S. It's the second recent U.S. warning shot across the bow of foreign telecom makers. At a Senate Intelligence Committee meeting in February, FBI Director Christopher Wray said any company "beholden to foreign governments that don't share our values" should not be able to "gain positions of power" inside U.S. telecommunications networks. FILE - The corporate sign of Qualcomm Inc. is seen in front of its office in Santa Clara, California, April 18, 2011. Compared to earlier generations of wireless technology, "we're seeing China emerge and start to play a bigger role in the standards developing process," Erensen said. Given a wave of consolidation in the telecom-equipment industry, fewer companies are involved "and the stakes are bigger," he said. The Committee on Foreign Investment in the United States, which reviews the national security implications of foreign investments in U.S. companies, cited concerns about Broadcom's penchant for cutting costs such as research spending. That could lead to Qualcomm losing its leadership in telecom standards, the committee wrote in a letter earlier in March. Should that happen, Chinese companies such as Huawei, which the CFIUS has previously expressed concerns about, could take a larger, or even a dominant, role in setting 5G technology and standards and practices. That's where national security concerns come in. "Over time, that would mean U.S. government and U.S. technology companies could lose a trusted U.S. supplier that does not present the same national security counterintelligence risk that a Chinese supplier does," said Brian Fleming, an attorney at Miller & Chevalier and former counsel at the Justice Department's national security division. Blocking the deal doesn't eliminate Chinese influence on 5G development, of course. But it might slow it down, Fleming said: "They honestly believe they are helping to protect national security by doing this."